Jordan Peterson Was an Expert Witness in a Murder Trial. The Court Called His Expert Opinions ‘Dubious’. Jordan Peterson is going back to court. The outspoken University of Toronto professor is launching a multi-million dollar defamation lawsuit against Wilfrid Laurier University one week after controversial teaching assistant Lindsay Shepherd launched her own lawsuit against Laurier. Both Peterson and Shepherd are represented by the same lawyer: Howard Levitt, who sometimes writes about his clients in his column at the Financial Post. 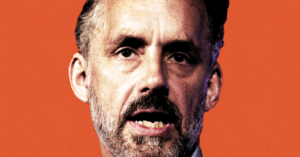 Several years ago, before becoming a YouTube celebrity and winning the admiration of the alt-right, Peterson was called as an expert witness in the trial of a Winnipeg man who confessed to police that he killed his friend and sometimes lover. The man later pleaded not guilty, claiming his confession was not true. He would go on to be convicted of manslaughter in two separate trials. 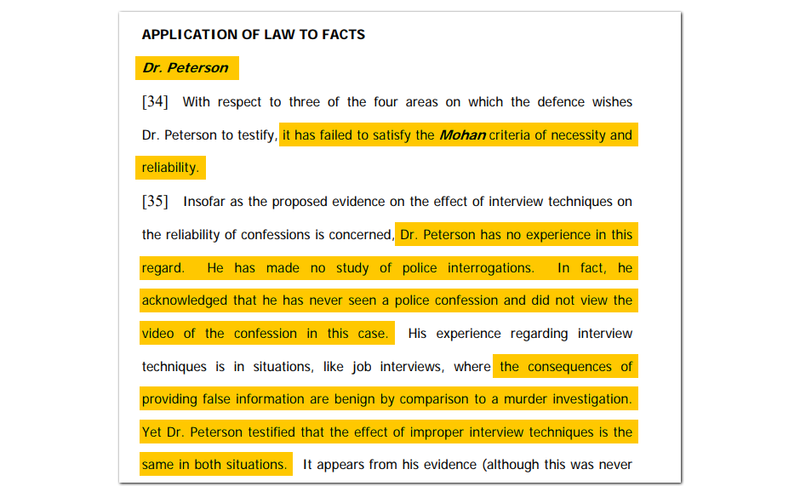 According to court documents reviewed by PressProgress, defence lawyers offered Peterson as an expert on “false confessions” and “false memories,” providing his expert opinion on the “reliability of the confession” the defendant gave to police. Except the judge questioned the “reliability” of Peterson’s expert opinions instead. Ruling on “the admissibility of expert evidence on false confessions” in January 2012, Manitoba Justice Shawn Greenberg ruled three-quarters of Peterson’s evidence was inadmissible and questioned his credibility as an expert witness. “Dr. Peterson has no experience” assessing “the reliability of confessions,” Justice Greenberg wrote in her ruling. Justice Greenberg also appeared puzzled by Peterson’s testimony on false memories. Justice Greenberg observed that Peterson got basic facts about the case wrong too. 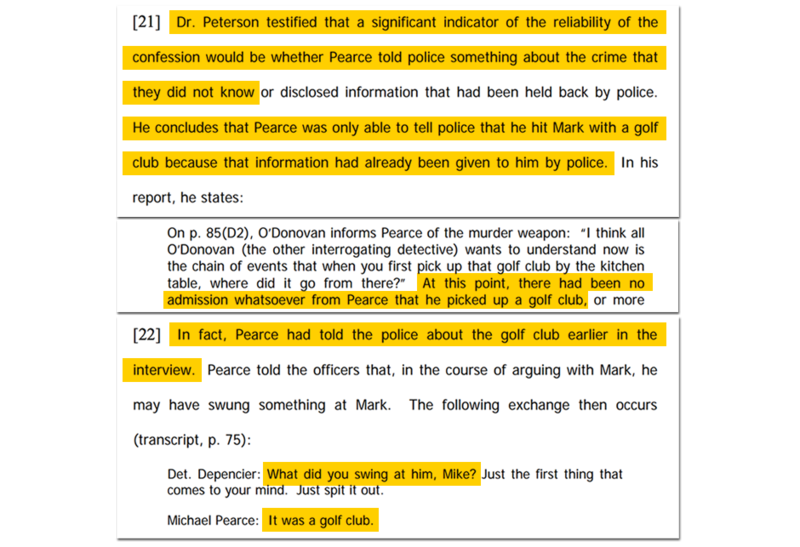 According to Peterson, the defendant’s confession was unreliable because he only admitted to attacking the victim with a golf club after police had first told him that the murder weapon was a golf club. Following the defendant’s conviction at his first trial, the defence’s appeal focused on these restrictions placed on Peterson’s evidence. The Court of Appeals, Manitoba’s highest court, sided with the trial judge, stating it was “satisfied that the judge did not err in her determination as to the admissibility of expert evidence” from Peterson. 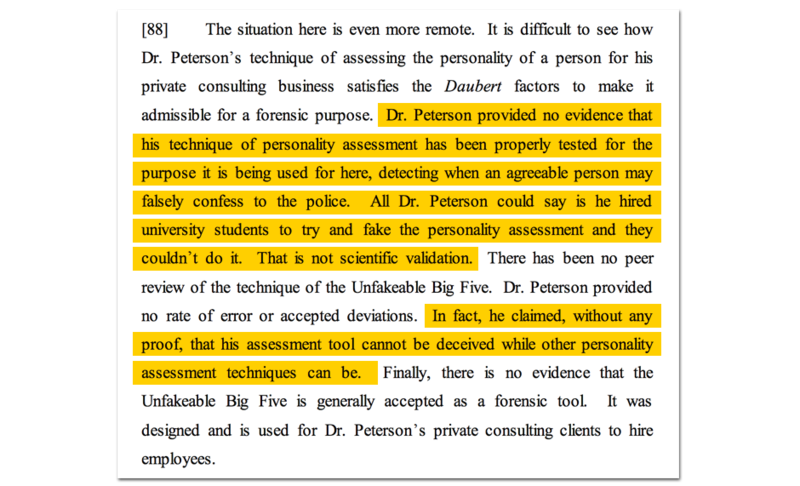 In a decision handed down in July 2014, Justice Chris Mainella raised additional questions about Peterson’s claim that an online personality quiz he authored (called the “Unfakeable Big Five”) could help exonerate the defendant. “Dr. 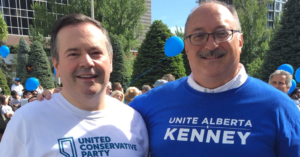 Peterson provided no evidence that his technique of personality assessment has been properly tested for the purpose it is being used for here,” Justice Mainella said. The Court of Appeals ordered a new trial. In 2016, the defendant was convicted of manslaughter for a second time. The defence did not call Peterson as an expert witness at the second trial.